After just five days of loving care! 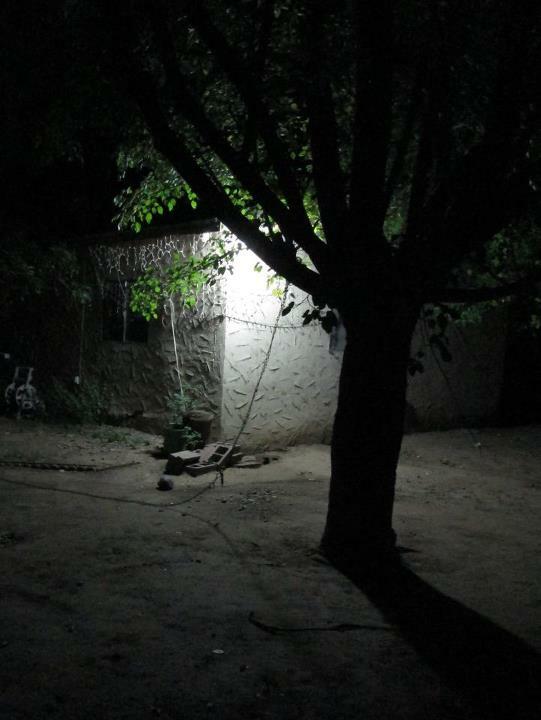 On Saturday night, 9/22/12 around 9pm…I received a call from Bernalillo County Animal Control Services Officer Nelson as she and Officer Valenti loaded up the dog from the scene. She told me about Ozzy and the horrific abuse he had suffered. She did NOT want to take this kid to the shelter and well, we don’t blame her! (named Ozzy, as I drove to meet him with CRAZY TRAIN blaring from the radio! I just knew he would be a force to be reckoned with) I met her at the emergency-vet as they began to work on him….Ozzy was lifeless, despondent and obviously in pain. BUT HE WAS STILL SO SWEET! !Bernalillo County Animal Control Services received the complaint from Ozzy’s previous guardian, that his “dog’s eyes had been gouged out” and answered the call immediately. What officer Nelson found after she arrived was a shock even to her. That is saying a lot, as the two of us have dealt with some of the worst of the worst, together. 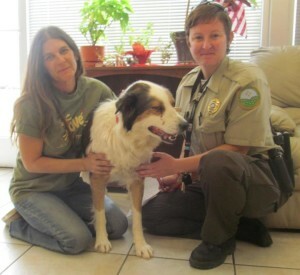 Ozzy was chained to a tree, no food, no water, no shelter on a dark and dangerous corner of a South Valley neighborhood. He had obvious trauma to his face, eyes and a severe wound on his neck from his collar and chain. He cried out in pain when she lifted him into her truck and the tears streamed down her face. I know this because I heard it in her voice when she called. Officer Nelson is more than just an Animal Control Officer. She is one of my closest friends and my partner in rescue for many years. It takes a lot to shake her, but shaken, she was.Ozzy spent the next two nights at VCA and Bernalillo County Animal Control Services generously covered his bill of $500. TEAMwork and we are so grateful for the concern they have for the animals they pick up! 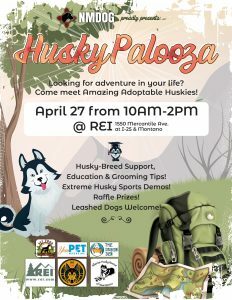 THANK YOU Bernalillo County Animal Control Services! He was stabilized with fluids and wound care. They provided him with great 911 care until we could have him transferred to Good Shepherd Animal Clinic Monday morning. 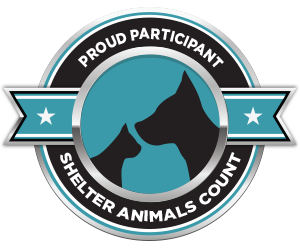 THANK YOU VCA Montgomery, for your great working relationship with Bernalillo County Animal Control Services and the compassionate care you give your patients! Once Ozzy arrived at Good Shepherd Animal Clinic, we began full assessment of the injuries, diagnostics and a treatment plan. 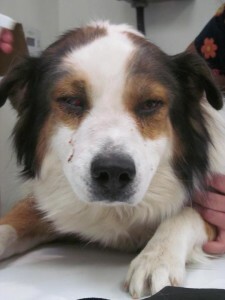 This is what we found out: Ozzy suffered acute blunt force trauma to his head, face and eyes. He had fractures on his face underneath his right eye and a hematoma on his skull. 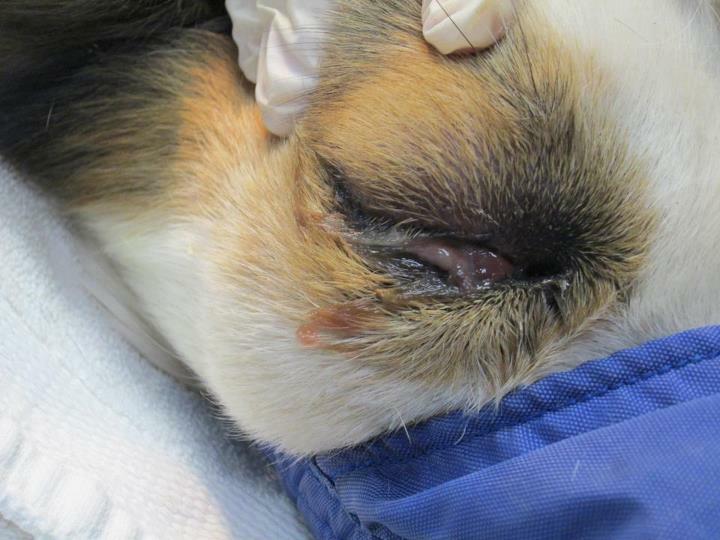 The wounds appear to have caused a severe infection in the area of his head and face, most likely creating the onset of conjunctivitis which has resulted in loss of sight. 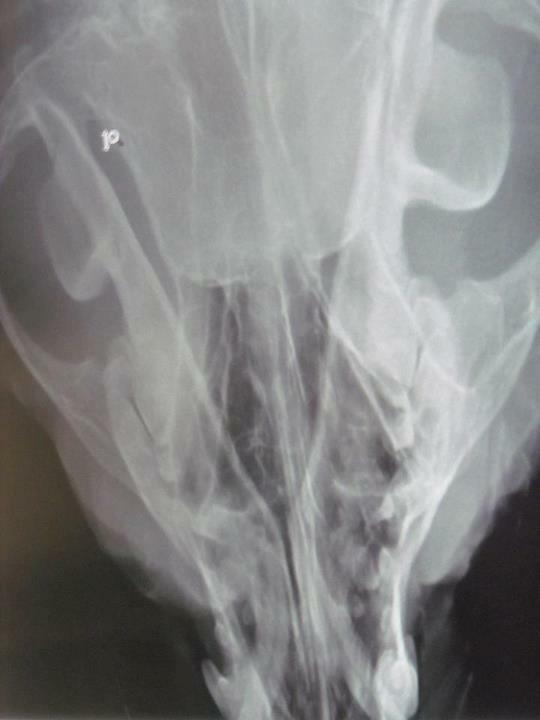 We hope to get all of the infection cleared up, get the bones on their way to healing, get a handle on his emotional well being and then we will reassess his condition and call on a veterinary eye specialist if needed. We won’t really know the long term prognosis concerning his vision until that time. 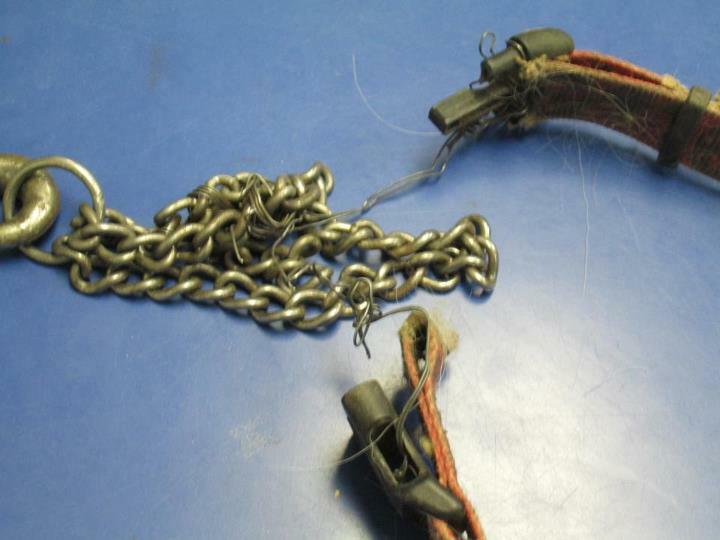 Ozzy also suffered a severe wound on the back of his neck where his nylon collar was attached to the chain by bailing wire. This appears to have happened over a significant period of time as the wound is now approximately 2″x2″ across and 4″ deep. Un-freaking-believable. 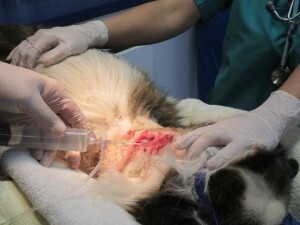 One can only imagine the amount of infection, the smell and the pain this dog was in. POOR Ozzy! Other than these issues, Ozzy does appear to be in good body condition. He has tested Heartworm Negative (-) and will receive appropriate vaccinations as he continues to grow stronger. His appetite is now good, he is drinking as he should, he enjoys the attention of the clinic staff and their kind words. He has begun to wag his tail and is now even GIVING KISSES!! WAY TO GO BUDDY!!! Charges for extreme animal cruelty have been filed and the previous guardian of Ozzy will have his day in court to explain to a judge how this poor dog was left to suffer in this condition. You can bet that Officer Nelson and NMDOG will be there in support of JUSTICE FOR Ozzy! But until then, it is our focus to make him whole again; to give to him the care and LOVE he went his entire “life” without, being chained to that tree for four years, since he was just a pup. Thank you, as always, for your support of our work here at NMDOG and know that we will NEVER stop fighting for THEM!